SKU: ZD-DUP3-WPV9. Categories: Adrenal Support, Athletic Boost, Brain Support, Energy Boost, Extracts, Immune Support, Longevity, Men's Health, Mood, Stress Relief, Thyroid, Women's Health. Tags: adrenal balance, Adrenal Fatigue, Anxiety, athletic performance, blood sugar, Brain Fog, Chronic Fatigue, cortisol, cortisol balance, depression, digestion, hormonal health, hormone balance, immunity, Metabolic Disorders, metabolism, Mood Disorders, Obesity, stress, Stress Burnout, thyroid, Type 2 Diabetes, weight control, weight loss. ADRENAL AND ENDOCRINE SUPPORT – NO MATTER HOW YOU MIX IT! Add this to your daily routine. You need it! I have been taking Endo adrenal daily for two weeks now starting to get more energy daily. Love the taste as a tea every morning when i wake up! Fast delivery, great taste and works very well. Use it every morning in my smoothies and juices. Earthy addition to a drink or food. So far, product is fine. Very earthy. I add it to tea. Every day, we pit ourselves against a world that demands so much of us. And yet, sometimes it seems like the world returns so little. Not so if one looks deep into the natural world for a little herbal assistance, however. Today’s generation is a generation of high achievers. We fill our schedules and plates with more than we can handle sometimes, despite our hunger for achievement and zest for life. But over time, this lifestyle can rob us of our health, energy, and well-being, sometimes in incredibly subtle ways. While on paper or at a glance, a friend or loved one (or even a doctor) would see us as completely healthy, it’s still clear though that something’s not right. We feel fatigued, drained, irritable, maybe even anxious sometimes. It can be hard to get out of bed. Though depletion of some sort is clear, it’s a sort of malaise that is hard to detect. This is because intense, chronic stress very likely affects the endocrine system. This is an often overlooked but still immensely important system regulating energy, metabolism, drive, mood, and so many other things. Parts of the endocrine system include the adrenal glands, thyroid gland, pituitary gland, and so much more. There are quite a few words to describe a tapped-out endocrine system. Stress burnout, adrenal fatigue, and even depleted immunity to some extent are results of a weakened endocrine system—or could even be synonymous with this unwell state of being. It is often overlooked by healthcare professionals. Only now are doctors and health practitioners beginning to take signs of endocrine weakness, deficiency, and adrenal fatigue seriously, and not attribute it to unrelated issues. This includes chronic fatigue, difficulty concentrating, difficulty sleeping, low energy, low drive, and many other subtle symptoms besides. A lot of this has to do with the fact that, up until recently, the medical world hasn’t fully understood the source of common symptoms like fatigue and brain fog. Now, issues relating to the thyroid, autoimmunity, and other parts of the endocrine system are being explored more thoroughly. Still, a good preventive measure is to take self-care into one’s own hands, with the help of lifestyle changes, diet improvements, and the help of research-supported herbs. Even if understood, there are few solutions to the problem. There are few medical answers to certain types of endocrine unwellness (such as hormone imbalance or thyroid problems), and most definitely not for adrenal fatigue, which is not officially or fully considered a health issue by doctors. So even if someone finds definite answers to their fatigue, brain fog, and other issues, often times they may just be prescribed better self-care tips regardless. And in addition to improving health through a less stressful lifestyle improved diet, a little additional home-remedy phytotherapy from herbs can give one the extra wellness boost they need. If endocrine and adrenals suffer, the whole body suffers. Many of us can vouch for the fact that if we feel tired, fatigued, foggy, or have a low immune system, then it really feels like the entire picture of our health falls apart. 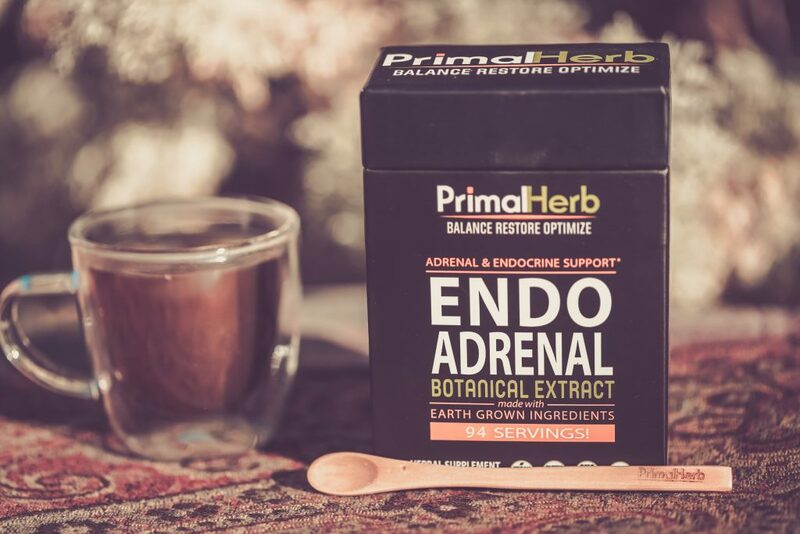 Here at Primal Herb, we’ve come up with Endo-Adrenal: an all-herbal, completely natural way to strengthen the entire body via the endocrine system and adrenals—using only wildcrafted herbs with stellar reputations backed by research, science, and long-standing tradition. In many ways, caring for the endocrine system, hormones, and adrenals is a holistic way to help us feel healthy overall. After all, immunity is tethered to the endocrine system, too—and when immunity is low in general, this opens up an unwanted portal to all sorts of diseases, illnesses, and issues that we would be better off without! Certainly, lifestyle and diet changes are the ultimate key to welcoming better endocrine/adrenal health in the long run. 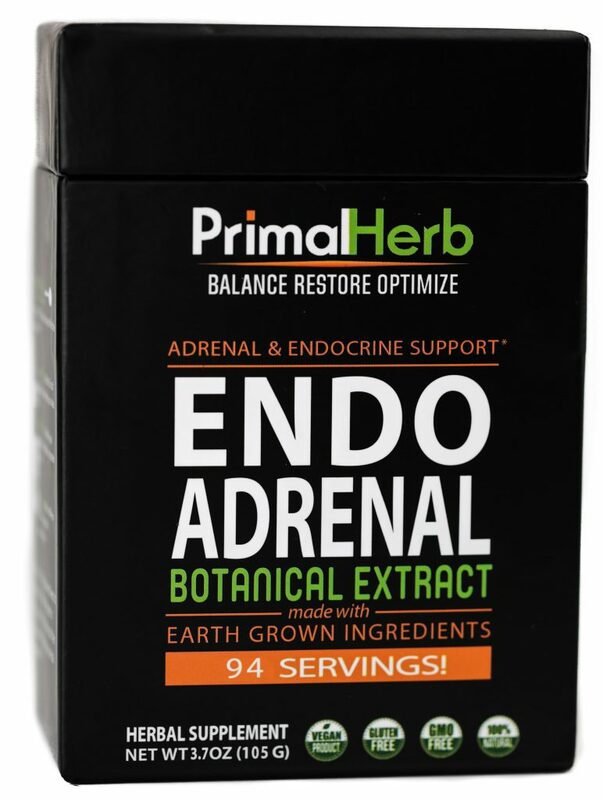 If an extra push is needed to get started, however, explore our Endo-Adrenal herbs, which can get the ball rolling when stress burnout and adrenal fatigue are just too difficult to climb out of! Ashwagandha, the prime Ayurvedic tonic of old, is the star of our formula. The evidence-based proof behind its benefits to human health is astounding. And that doesn’t even dig into the science! This herb from India is a popular health adaptogen (helping the body “adapt” to stress) and is known to simply reinforce health and wellness all around. The ways it has been observed to work is by directly targeting the endocrine system (especially the thyroid) and also restoring energy, including vitality. One of ashwagandha’s most interesting qualities is its ability to reduce adrenal fatigue by helping to minimize excess cortisol output, as found in this 2012 study. This, in turn, brings enormous benefits to stress and anxiety, in addition to reducing fatigue and brain fog. In earlier 2010 research, ashwagandha was also observed to be naturally regulating both male and female hormones as well as thyroid hormones into a healthy balance in test subjects. In short, this makes this herb a very helpful natural solution to issues such as low drive, thyroid imbalance, and perhaps even minor “intimate” dysfunction as well resulting from overall endocrine imbalance. Eleuthero is yet another herb for which we have Asian folk medicine to thank. It is also commonly called Siberian ginseng because its health benefits are comparable to the legendary ginseng, a similar root that is always in such high demand all around the world. The root of this plant is quite popular among health nuts and fitness gurus. This is because there are many studies showing that it enhances athletic performance, energy, and metabolism—the latter two being aspects of health governed by the endocrine system. Last but not least, Siberian ginseng is well-known for its ability to keep stress burnout at bay, in effect improving the body’s ability to withstand stress by keeping up energy levels and metabolism. All of this is rooted in a healthy endocrine system and adrenal function: if these systems struggle, then endurance, energy levels, and stress coping mechanisms will struggle as well. A 2010 study showed that eleuthero’s abilities to boost energy were certainly measurable—and considerable! A much broader review of the herb in 2013 draws upon yet more evidence and studies supporting eleuthero’s endocrine capabilities. If anyone needs an ally in their corner to get metabolism, energy, stress endurance, and physical endurance back on track, it’ll be the eleuthero found in our formula. Often called the “arctic adaptogen” by herbalists and health practitioners, this is because this alpine botanical grows in far northern regions. It’s also garnered quite the reputation for strengthening health and helping to recude the chances of illness. Much like eleuthero in Asia, rhodiola has been used among far north cultures (including the Vikings, Siberians, Saami, and many others) to boost energy, stamina, and endurance. It was also helpful for alleviating stress, anxiety, and fatigue. It is highly likely that it achieves these effects by targeting the endocrine system. While major studies drawing solid connections between rhodiola and the endocrine system are lacking, nevertheless there is some interesting research on the subject. One 2010 article in the Journal of Medicinal Food called for more research on this connection. It suggested the use of rhodiola for helping with common symptoms of thyroid dysfunction—hypothyroidism in particular, which is a common thyroid imbalance causing weight gain, chronic fatigue, and lower physical energy and performance. Schisandra provides yet another miraculous adaptogen remedy from Asia. It has also been called “five flavor berry” at times because it was perceived that one could taste all five tastes when the berry of the plant was consumed: sour, salty, sweet, bitter, and savory. Since the berry held all the possible flavors, it was also thought that it could cure all ails. While that’s been proven to be not quite true, it is true that its powers as an adaptogen strengthen overall health, which in turn help the body reduce the chances of all sorts of illnesses, diseases, issues, and weaknesses. Much like ashwagandha, schisandra can naturally help reduce cortisol levels, a result of endocrine imbalance (as shown in this 2015 study). This in turn protects the adrenal glands, reduces stress, boosts energy, and even raises immunity. Fitness lovers and athletes no doubt love herbs like eleuthero just as much as they love cordyceps. This is because both herbs are widely recognized for their abilities to boost athletic performance and energy—energy that is rooted in the endocrine system. Cordyceps is a mushroom remedy with probably one of the most fascinating backgrounds in the world. It infects insects for a time and then, when it is ready to “bloom,” it drives its host to climb the tallest tree, where the insect finally dies and the mushroom grows, erupting from the creature’s exoskeleton. Not uncoincidentally, taking this mushroom can give us some much-needed drive in our lives as well (though with a much happier ending). While it’s still speculation as to how it works, a 2010 study found that older subjects who took cordyceps had much better physical energy and stamina on average. It appeared that the mushroom acted upon metabolism to make this happen—thus making it a healing herb for the endocrine system. 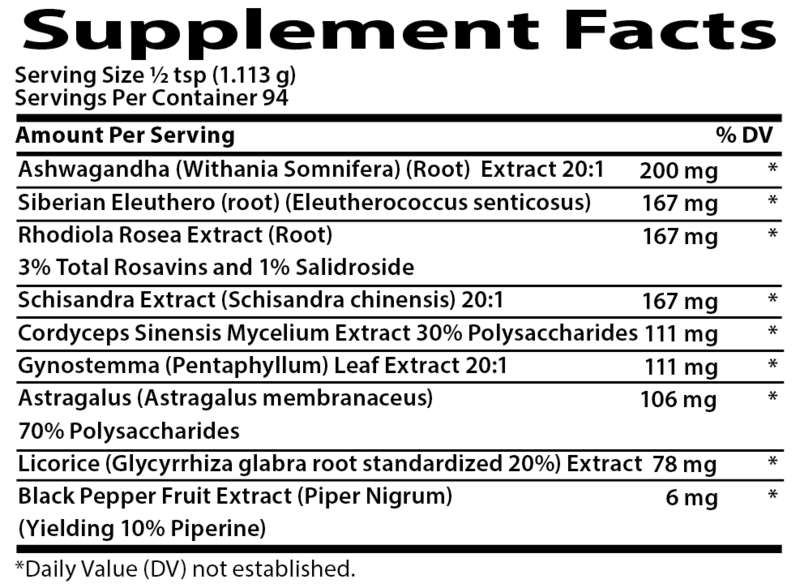 Gynostemma (also known as jiaogulan) ends the lineup of world-renowned adaptogens from Asia. This one has gained its claim to fame in its own unique way: locals of southern China, where the plant is native, were known to take the plant as a tea every day. These same locals have been studied for living to ages of 100 and beyond, which made the vine-like gynostemma receive worldwide interest. No doubt, part of why gynostemma may extend long life is due to its endocrine-protective properties, though these are hard to understand. For one, gynostemma does act on metabolism by helping lower blood glucose and thus reducing the chances of obesity (as seen in this 2010 trial), which can be signs of metabolic imbalance (especially in cases of type 2 diabetes and some hypothyroidism). On the other hand, gynostemma also appears to indirectly help with stress and anxiety by modulating hormones like dopamine, serotonin, and corticosterone (in this 2015 trial). If concerned about mood imbalance, hypothyroidism, and blood sugars in relation to endocrine imbalance, then gynostemma will be another great herb in our formula to have on your side. This herb with a sweet taste is part of the genus Astragalus, which hosts thousands of medicinal species. It is also closely related to many legume plants: including beans, peas, soy, peanuts, licorice root, and many others. While other adaptogenic herbs may handle various levels of endocrine health, no other handles the digestive aspect of this as directly as astragalus. Traditionally, it has also been used as a remedy for digestive disorders, diarrhea, and even anorexia on top of restoring energy, vitality, and reducing fatigue and stress burnout. Astragalus is perhaps most well-known for raising immunity, as described in this 2011 study. Often, reduced immunity can be the indirect fallout of endocrine imbalance. In addition however, a 2010 study on tilapia found that astragalus could particularly boost metabolism and immunity in the gut. After all, digestion can take an indirect hit from reduced metabolism and endocrine function—so by having astragalus included in our blend, the digestive issues are taken care of. Licorice is a close relative to the aforementioned astragalus, and has quite a bit in common with the vine-like herb. With a much sweeter flavor in comparison, licorice is better known for revving up the immune system, in addition to improving tired states, difficulty concentrating, and all-around fogginess from endocrine deficiency. Take licorice, and one will find their immune system performing at a higher level than ever before. But licorice has also been studied (in 2014) for stopping endocrine imbalance in its tracks alongside its bolstering effects on reduced immunity. In fact, in this study, its endocrine and immune effects were appealing enough to consider the herb as an anti-cancer agent! 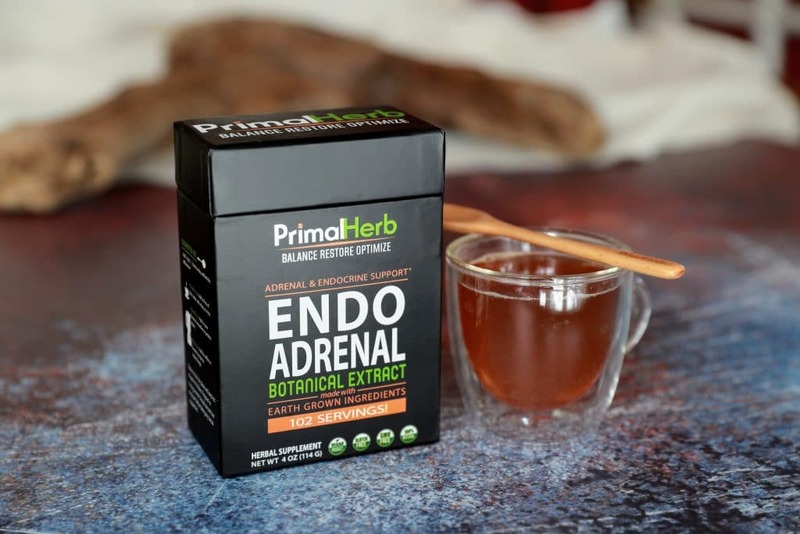 Endo Adrenal can be taken day or night – with or without food, so enjoy! made me feel better emotionally. I have been using this for four days, and I do feel calmer, more upbeat and even. I still feel tired, but less so. I take this and the Chaga and it has seemed to be quite effective in the short term. I will update my review once I have taken it for a while. I am not sure if it will help with my hormone imbalance and weight gain from a recent round of prednisone, but so far I has, at least, made me feel better emotionally. The flavor is good and easy to mix it in with my morning breakfast shake.